A companion painting to Street Scene – Restaurant, Interior Scene dispassionately shows white customers interacting with black prostitutes inside a filthy room. Despite this potentially raunchy scene, the image is cold, more focused on the business side of the arrangement than the sexual side. Lawrence’s refusal to make his figures detailed or realistic creates the impression that they are mere representations instead of actual portraits. His simple style contrasts sharply with the complicated emotions often aroused by his choice of subject. 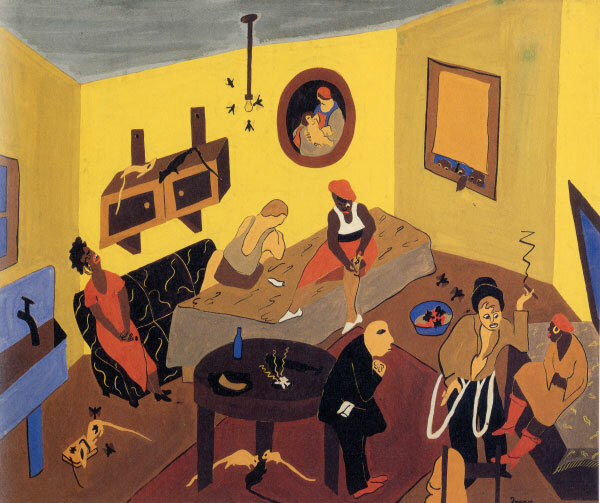 Jacob Lawrence, Interior Scene, 1937. Tempera on paper, 28 x 33 ½ in.